Living Health Group > Blog > Be Informed > Eating out this weekend? We are coming into the festive season, of football celebrations, spring carnival, end of year Christmas parties and then Christmas. This can be a time period of many celebrations, drinks and eating out. For some people, eating out can be a frequent experience, regularly grabbing take away or eating out at lunch time from work. The good news is, eating out does not have to be unhealthy. Making healthy food choices when eating out can be easy. 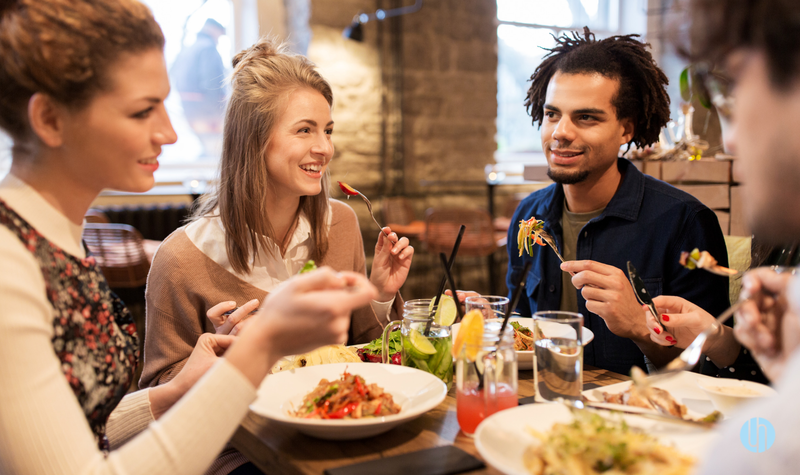 Here are a few tips to encourage healthy eating when eating out. in some sauces and dressings. Having your dressing or sauces served on the side can reduce the amount of hidden calories you may consume. If you are concerned about serving sizes, order an entree size meal. This will help you to not overeat. Limit alcohol consumption to 1-2 drinks with your meal. Alcohol is an easy way to consume extra calories, which can lead to weight gain. Most importantly enjoy your meal, don’t beat yourself up if you have a ‘cheat meal’, get back on your healthy eating on the next meal of the day. In"Be Informed" , "Be Nourished"
Are your heavy handbags weighing you down? Living Health Group offers a range of health services at one convenient location. We take a collaborative approach to help facilitate the restoration, and maximising the efficiency of the body’s, health and wellbeing. Is your jaw causing you headaches? What footwear should you be wearing this summer? Why being grateful is important? Living Health Group is a team of passionate practitioners who are driven to help you improve your performance and achieve your health goals. Sign Up To Get Amazing Offers and Health News from Living Health Group.